By now, you all know that I love participating in Strange But Good…the wonderful Friday link-up created by Laura at Sprint 2 The Table. I’ve always gotten side long glances from people regarding what I eat. The family is used to me but others…I get the funny looks. However…it will not STOP me!! I love coffee…I LOVE COFFEE! So I’ve confessed. 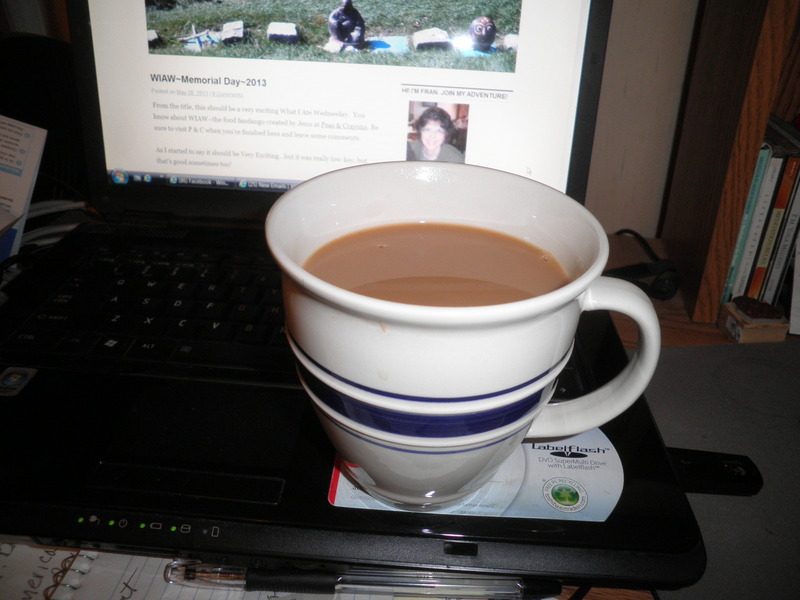 The funny thing about me though as a coffee drinker is, I rarely drink it after my morning coffee. I’ll have the occasional Dunkin’ Donuts meet up or once in a while a Starbucks when I’m at Barnes and Noble (Love the new blonde roast!) but generally, it’s me and my morning coffee. There’s a dumb thing that you’d think I would have been doing all along, but in the last month or so, I’ve started setting my coffee up at night. I can’t tell you how great it is to come into the kitchen and just Push The Button! No messing with water or filters…just Push The Button. The coffee starts, I open up the computer and then the coffee is ready. It’s a wonderful thing. So how does any of this fit into Strange But Good. My favorite coffee in my current favorite mug (69 cents at Goodwill-can’t resist telling you that!) (still annoyed that there is no longer a “cents” symbol on keyboards…) What’s so special about this coffee? Well, I suppose there’s nothing especially special or strange about this coffee but when I tell people about it, I sometimes get that tilted dog head look from them. This is known in our family as “beach coffee.” The reason for that is a long story that I don’t feel like telling right now. Hmmm…seems I say that a lot…oh, well. Someday I can write a post called “All of those stories I didn’t feel like telling before.” Maybe it should be a series! This coffee is simple but it does need to come with some instructions. Prepare to make your coffee with however much water and however much coffee you want. Before you turn on the machine, sprinkle cinnamon into the coffee grounds. You can use as little or as much as you like. I never measure it, I just shake it in and I add quite a bit because I like it that way. The caution about it is this…be Sure to mix the cinnamon into the coffee grounds before you turn on the machine. For some reason, the cinnamon forms a barrier to the water. I have several times had the coffee overflow because the water can’t penetrate the cinnamon. Not sure why that is, but it does. Simple, right? Yes it is which is what makes it so good. It doesn’t take much effort on my part to make something unique and tasty. Besides, the cinnamon is good for me and the combination of the smell of coffee and cinnamon is a wonderful thing to wake up to! 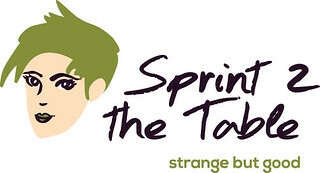 Be sure to stop by Sprint 2 The Table to see the fun things that people are actually cooking to qualify for Strange But Good…oh, Yes, leave some comments, too! This entry was posted in Uncategorized and tagged coffee, Strange But Good. Bookmark the permalink. Come on, Ele…you know the recipe! Oh…I forgot…tummy troubles…that’ll be fixed soon and you can have some!! perfect timing as i am standing here drinking my COFFEE and blog reading! yup, i don’t get the cinnamon + coffee + overflowing coffeemaker either, fran – we need some scientific help with that one. glad you discovered this neat flavour trick! and i am with you…i rarely have coffee past 11 a.m. -> but it sure is good first thing in the morning!! Thanks, Cathy!! I’m so excited for you! Hope you find some good coffee in Costa Rica!! Stay in touch and travel safe!! Thanks, Martie! You’re right, it is a Be Still Moment! Thank you for sharing it on Be Still! I’ll see if I can rustle up someone to Like the page! Have a great weekend! I love coffee but don’t have it after the morning. Well, occasionally I’ll have a cup of decaf in the evening if we have company. Isn’t it funny that way, Diane. We really like it but don’t have it later in the day. I guess that’s a good way to stay in control! Have a great weekend. I adore this trick! My mom taught me to do it long ago. She (and my grandmother) also add a shake of salt. They say it cuts the acidity?! Thank you for linking up!! Hope you have a great weekend and your fridge gets sorted out (Mom’s pooped out yesterday too!). Thanks, Laura! It’s my favorite coffee! I’m renting space at my friend’s freezer, but she’s leaving town for the summer next week, so I may be in trouble. Oh, well…it’ll be a challenge…make me a better person…sure it will. 😉 Have a great weekend! So funny to see your post about the coffee…my son, who moved back home almost a year ago, makes coffee for us this way, too…only he doesn’t know the excellent tip about stirring it into the grounds…can’t wait to tell him that Beach Coffee is a hit amongst food bloggers! Hi Chrissie! How nice to hear from you again! Yup, I learned that tip the hard way and it’s a big help. Every once in a while I forget and I’m NOT happy with myself! Glad you like your coffee that way too. Have a great weekend!